An iron painting depicting a landscape with a setting of pine trees growing from the edges of cliffs among clouds. The foreground has two large, dense pine trees. The upper right-hand corner is inscribed with a poem written by Chairman Mao Zedong, after an inscription stating that this iron painting was created in December 1964. A rectangular mark in red at the end of the inscription reads Tie Hua (iron painting). The lower left corner of the painting has another mark in red in a square, imitating a seal stamp, reading Wu Hu Gong Yi (‘crafts from Wuhu’). The landscape, inscriptions and marks are all made as wrought iron elements, which are crafted individually and joined together with bolts. The painting is contained within a hardwood frame. The contrast in this iron painting between the dark iron and the lighter background results in a striking two-dimensional equivalent of ink painting. The art of iron painting was developed in Wuhu city of Anhui province in the late 17th century. According to Jenyns and Watson: “…Tang Tien-chih, an iron worker, set the example by vying with the painter Hsiao Yun-tsung in depicting landscape.” The subject matter depicted here echoes the poem inscribed on the upper right-hand corner. The poem, consisting of four phrases with seven Chinese characters each (known as Qijue), can be translated as follows “Amid the growing shades of dusk stand sturdy pines/ Riotous clouds sweep past, swift and tranquil/ Nature has excelled herself in the Fairy Cave/ On perilous peaks dwells beauty in her infinite variety.” This poem was written by Chairman Mao Zedong (1893 – 1976) on 9th September 1961, with the title ‘The Fairy Cave – Inscription on a Picture Taken by Comrade Li Jin – a Qijue’; it was first published in The Poems of Mao Zedong in 1963. The title refers to a poem written for a photograph taken by Li Jin, also known as Jiang Qing (1914 – 1991), the fourth wife of Mao. 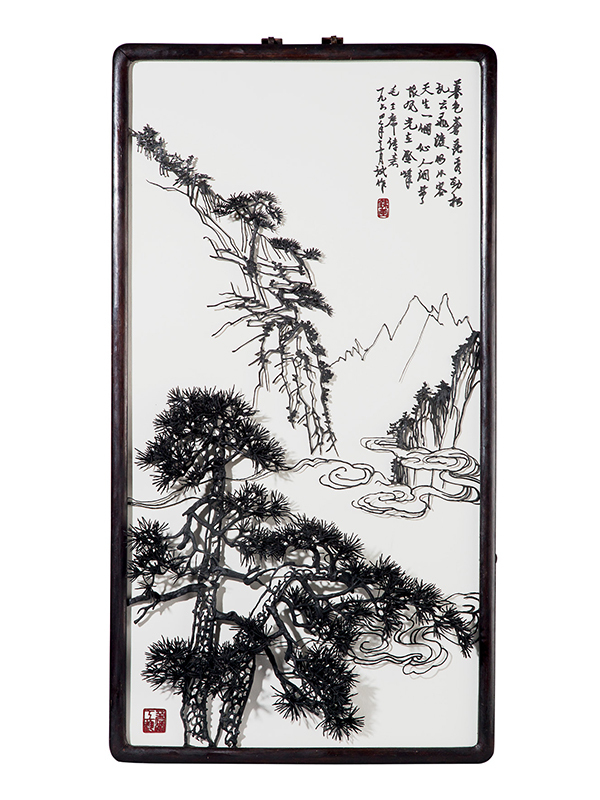 The pine tree enhances the scholarly theme, as it is a symbol of longevity. There are only two sets of iron paintings that are attributed to Tang Tien-chih, the creator of this type of artworks: a set of four depicting flowers and birds of four seasons is in the collection of the Palace Museum, Beijing. Another example depicting a Chinese landscape is in the collection of the Zhenjiang Museum. There are two further comparable sets: four 18th century iron paintings representing the seasons are in the collection of the British Museum. Four further comparable iron paintings dated to the 17th century were included in the exhibition, The Chinese Scholar’s Studio: Artistic Life in the Late Ming Period from the Shanghai Museum in 1987.